Ever since I was a little girl, I have loved to read. The first book series I ever fell hard for was Beverly Cleary's Ramona Quimby books. I spent the whole summer between third and fourth grade willfully sequestered in my room, buried in the tales of the unruly, whimsical Ramona (who I wanted to be) and her older sister, Beezus (who I am really more like). It wasn't long after that I became enchanted by Harry Potter's wizarding adventures, devouring each book within days after its release. During high school, I was in honors and AP English classes, so we'd have additional assigned reading to complete during the summers. It was usually two or three novels, classics like Fahrenheit 451, Jane Eyre and Anthem. Most kids reviled this extra work, but I secretly loved it. A couple of new books to entertain me during the long, inhospitably hot summer months? Don't mind if I do! For me, reading feels like an emotional and mental escape into another world. Even if it's a stressful or sad book, it gives me a break from my own stress/sadness. It's more interesting to me than watching a movie because I get to cast the characters in my mind and decide what the setting looks like. It's almost like its own work of art that only I get to enjoy. I also like non-fiction because it allows me to focus my mental attention on some new concept, person or historical aspect I don't know about. No matter what genre, a good book allows me to relax and forget my cares for just a bit. When my friend Lauren introduced her company Bookshelf Tees, I was ecstatic. Finally, a graphic tee I could relate to! 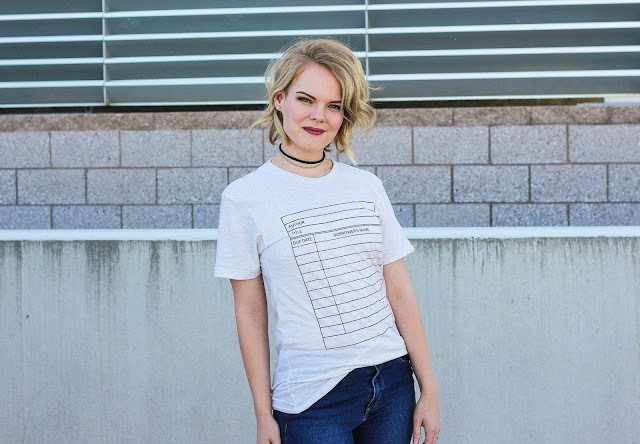 I ended up modeling the Library Card shirt for her site -- my absolute favorite. Takes me right back to being a kid in the '90's! Coolest shirt ever. It's even in a light oatmeal color, just like the manila cards we used for checking out books back then. Another thing I like about Bookshelf Tees -- the shirts are so soft, comfy and unisex! These are some high-quality shirts. I have washed mine several times and they show no signs of wear. They also don't shrink or pill. They're just great. I could live in mine. And if you follow me on Snapchat, you know I practically do. And Lauren's really thought of everything, because Bookshelf Tees even has its own virtual book club! WHAT?! If that's not brilliant, I don't know what is. You can check it out and join here. Today, I'd like to give away $25 shop credit to Bookshelf Tees! I actually earned this credit by modeling, but since I already own two tees myself (Girls Just Wanna Have Books is my other one -- clever as all HECK), I decided to share the wealth with you all. What better way to show my gratitude for my readers than by giving you stuff? Right? To enter, browse the Bookshelf Tees shop and leave me a comment HERE -- on this blog post -- telling me which one is your favorite. The winner will be chosen and announced on Monday, August 21 at 9 AM! I completely love the one you're modeling the best! So darn cute!! Love these! Town between the Anne of Green Gables and Little Women squad tees. Stay Gold Pony Boy - CLASSIC! The Ousiders is still one of may favorite books even though the first time I read it was in 6th grade! I like the Girls Just Wanna Have Books one and the one you're wearing! Can I just say they're all my favorite? I can't pick just one, I want most of them! Haha. Girls just wanna have books! So hard to choose! I think Girls Just Wanna Have Books. The library card shirt you're modeling is my favorite! Oh my goodness!!! So many favorites!! Especially as a teacher I feel like I need ALL of them!! Gilbert Blythe! ❤️ Anne of Green Gables is one of my all time favorites! That library card is amazing too! Ahh! I'm an elementary school librarian so I pretty much want all of these to wear to work... but the library card tee and the ponyboy shirt are my top two! I love the reading fiction is my addition shirt. Or the girls just wanna have books shirt for my new kindergartener! I like the ones that are sold out :( but I'm looking forward to the Lumos Maxima new shirt posted on their Facebook page as coming soon! For the current available ones I like the Anne of Green Gables ones. I can't decide between Reading Fiction is my Addiction and Girls Just Want to Have Books. They're all so good! Love "The brightest witch of her age" but also the library card. I think the tote with the Arthur library quote is also darling. 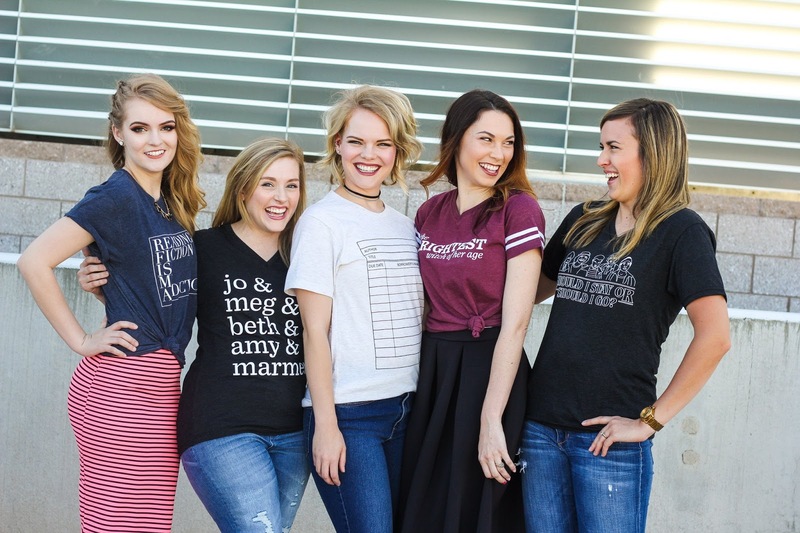 Love the brightest witch of her age, the little women squad tee and the Gilbert Blyth tee! I love Lauren's stuff. She's always had the best style! You and your sister are total babes! Love, love, love this line idea! My fave is definitely the library card tee. Such a throwback to some great page travels back in the day! Love the "Girls just wanna have books" shirt! Super cute stuff! The one you're modeling is my all-time fav because it totally takes me back to the days of checking out books as a little girl at my local library or the library at my school. Those were simple times before kindles and tablets and to this day I will always choose the crisp feel of pages in a book over digital ones I tap on a screen. I especially love the moldy smell of old vintage books as well! Nothing like it lol! We would've been great friends as kids! I always loved books too! When I was a child I loved the Ramona books as well but my all time fav books were the ones by Roald Dahl, Matilda in particular. I loved his whit and the way he told a story always made me giggle. Anyhow...totally all over the place with this post but I'm also digging the "Girls just wanna read books" tee as well since books= fun. I'm sure that's the true lyric Cindi Lauper was going for anyways. I love these! I think the girls just wanna have books is my favorite! I love these! I think my favorite is Party At Gatsby's or Girls Just Wanna Have Books! Party at Gatsby's and Read Banned Books!!! I love these! I just ordered the Girls Just Wanna Have Books, but I'd love the library card one as well! Reading fiction is my addiction! And the library tee! I love them all! Reading Fiction is my addiction for sure! I love Girls Just Wanna Have Books and he one listing the Austen boy names. Love these shirts! Love that library card shirt! Super cute! My favorite is the youth size of Girls Just Wanna Have Books -- it fits my Seara to a T! I love the library card one, but I'm crazy excited about the one she has set for a new release that's Harry Potter themed!